“Where to begin…….As you know, Zoe lost her left leg on Easter Sunday 2011 in a jet ski accident and has endured 16 surgeries and over the course of 14 months spent 92 days at Tampa General. Life for us has been challenging to say the least. During the initial hospital stay (8 weeks) my employer of 7 years was unable to keep my job open for me. That was very difficult as I am the primary source of income for our family as my husband, Charles is disabled by Parkinson’s Disease. Since Zoe’s accident, we have been very blessed by amazing support from friends, family and our community, both emotionally and financially. I can honestly say that meeting Steve has been our biggest blessing! The financial support of 50 Legs has provided opportunities for Zoe that we would not have been able to do otherwise. Because of 50 Legs, Zoe was able to attend a camp in North Carolina specifically for amputee children. It was an amazing, life-changing adventure for her! 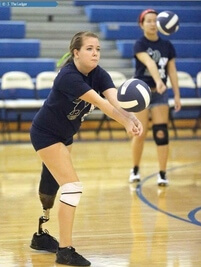 But the biggest blessing of all was when 50 Legs provided an Echelon Blade Foot for Zoe that has the spring-action she needed to play her beloved sport of Volleyball again! She has since made the Varsity Volleyball team for her high school! We are so proud of her determination and so very thankful for the support of 50 Legs! We would never have been able to afford this specialized foot for her. God is working mightily through Steve Chamberland and 50 Legs! Words cannot describe how appreciative and thankful we are to all the supporters of this wonderful charity!